deSIGNery Sign Company is a supplier of high quality screen printed custom luminous stickers. When purchasing custom glow-in-the-dark stickers online, always request samples to be certain that the product you are about to purchase will fill the needs of the project that it is being ordered for. For samples, please visit out contact us page and click on the link for samples. From warnings to advertisements, we offer a wide variety of custom printed luminous glow-in-the-dark wall decals to suit your needs. We can also customize a decal that shines in the dark if you prefer a more unique and personalized look for your walls. Phosphorescent decals are available in white only. Check out our Spring Sale for savings on Custom Luminus Stickers and Glow-In-The-Dark Stickers in the following link. BBB Member since 2004 with a proven record of complaint free customer satisfaction on items like Custom Luminus Stickers. Click on the BBB logo above to check our record or leave a customer review. If you are in the market for Glow-In-The-Dark Stickers, give us a call today and you will soon realize why after 24 years we still have an A+ BBB rating! At deSIGNerySigns.com we have more than 24 years experience in designs for our Glow-In-The-Dark Stickers. Call us today and let our design specialists help create your next project to promote your product or business. FREE Shipping on all decal and sticker products | Free layout | A+ BBB rating | 24 years in the business | Call Today for a free quote on Glow-In-The-Dark Stickers. Luminous vinyl will glow for about one hour after being exposed to ordinary light for approximately 10 minutes. Material is normally supplied with permanent pressure-sensitive acrylic adhesive. Decals are furnished with split backing for easy application unless the size is 1” x 1” or less. Glow-in-the-Dark or Photo Luminous Technology is the process of absorbing and releasing light energy. Examples you might have seen, on the hands or numbers of certain watches and clocks. In the dark, the numbers or hands give out a green glow, which is clearly visible in the dark and fades out totally within an hour. Unlike chemical glow like light sticks, photo luminous glow can be used many times over, just by exposure to light. These are stickers and decals are made with a phosphor substance that emits visible light after being exposed to natural light. They are not powered by nuclear reactors, batteries or electricity, and they do not glow all night. They are great stickers for walls in kids rooms and nurseries or any product that is used in the dark and is periodically exposed to light. For our competitive prices on Custom Glow-in-the-Dark Stickers, click on the link above! 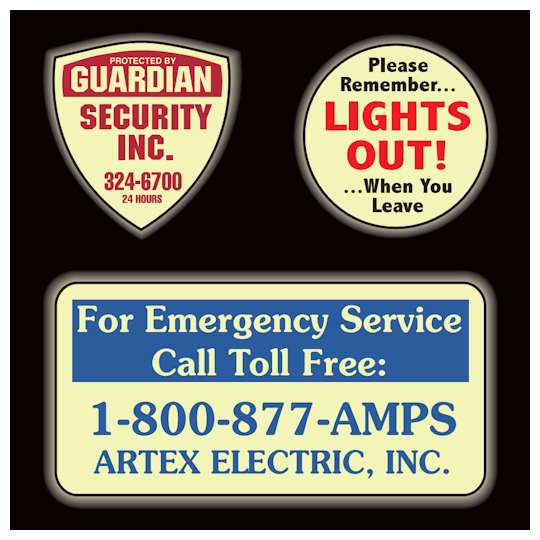 Glow-in-the-dark luminous decals are intended for indoor use like around light switches and keyholes in doors.